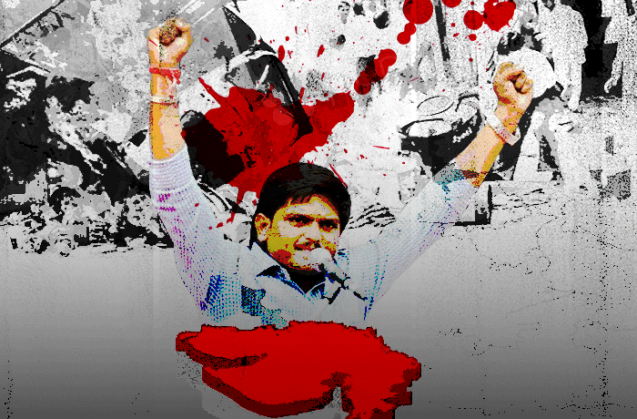 After the Patel rally, social media is full of calls for an end to reservation. Could it all be an RSS ploy? Six people are dead and dozens injured in Gujarat. Public property has been destroyed and the army has been called in to restore order. The Prime Minister and various other leaders have called for calm. What started as a students' movement to demand reservation for the Patel community under the OBC category has snowballed into a violent state-wide agitation. And yet, the leader of the movement, 22-year-old Hardik Patel, insists his supporters are not the ones resorting to violence. The Patel community in Gujarat has always been seen as socially and economically influential - by journalists and academics alike. But the question that naturally crops up is, does such an influential community really need reservations in government jobs and educational institutions? If the answer is 'yes', then the Patels' agitation can be said to be based purely on economic reasons. But a negative reply paves the way for several other possibilities, including doubts about the agitation being sponsored or engineered by some others for a different purpose altogether. The most common suspicion is that the unrest has been instigated by people who need some valid excuses to remove Chief Minister Anandiben Patel, who is desperately trying to come out of the shadow of her predecessor, Prime Minister Narendra Modi. But, then again, if the people who installed her so smoothly want to get rid of her, they can do so without any real need for an alibi. Playing with Patel sentiments is a too risky game plan for the goal of removing the CM, especially at a time when Gujarat is heading for a series of local civic body elections. Adverse results in these could severely dent the image of the ruling BJP as well as the Prime Minister. This is why this suspicion seems rather unlikely. More significantly, a demand for reservation by a community known to be financially well-off and socially influential actually shakes the foundation of the tall claims of Gujarat having been developed during Modi's tenure as CM. Modi's critics as well as the general people could ask - 'what is the development all about if the most economically influential community has to seek reservations in government jobs'? Patels of all denominations have dominated virtually all sectors of the economy in Gujarat, ranging from diamond polishing to textiles, groundnut crushing, cotton ginning, pharmaceuticals and real estate. Political parties could always rely on Patel business houses for bagfuls of cash at just a few hours' notice. Even in hard times, Patels in the diamond polishing trade could be trusted to splurge Rs 4 crore to buy the infamous suit bearing pinstripes of the PM's name, and save his sinking image. Then, there are reports of a diamond merchants' buying spree pushing up property prices in Surat, and of some even gifting swanky cars to their employees on Diwali. Being just about 15% of Gujarat's total population, Patels have always enjoyed much more than their fair share of being pampered by the political parties. Though numerically not populous enough to be considered an en bloc vote bank, Patels have grown to be the most influential community in Gujarat through a socio-economic process which took nearly a century. Originally an agrarian community called 'Kanabi', they are known by their caste name Patidar, and still maintain closely knit caste councils. 'Kan' means grain, so 'Kanabi' literally means those deriving livelihood from grains i.e. agriculturists. Many of them migrated from mainland Gujarat to the Saurashtra region in the latter part of 19th century to work as tenants in the fields of the princely states ruled by local Rajputs. Cultivation of cash crops like groundnut and cotton since the early part of the 20th century made Patels much richer than other farmers, who mainly belonged to local backwards classes. Implementation of land reforms by then-Saurashtra chief minister Uchchhangrai Dhebar in the 1950s made these Patel farmers the owners of vast patches of land that yielded cash crops like groundnut and cotton. Agricultural income being tax-free, the Saurashtra Patels invested their surplus money to start groundnut oil mills and cotton ginning mills, thus reaping the benefits of value additions, leading to much more additional cash. This was again ploughed back into starting small and medium industries in the region, mainly foundries in Rajkot and brass industries in Jamnagar. With the economy growing further, surplus money was diverted to textiles, pharmaceuticals and the diamond polishing trade in the industrial corridor of Ahmedabad, Vadodara and Surat. Later on, the community also diversified into the real estate business, with Patels investing in large chunks of land to be sold as and when prices increased due to demands from new industries. All these factors nearly conclusively prove that there is no economic logic behind the community's demand for quotas in jobs and professional courses. And, more importantly, for the last two decades, the community has been the BJP's strongest base, providing logistics, manpower, money and huge infrastructure for all the extravagant shows of the saffron party and its 'vibrant' government. Would the Patels really like to rock their favourite party's boat at a time when "their man" is at the helm of affairs at the Centre ? This tricky question can be answered by a closer look at the slogans the Patidar Anamat Andolan Samiti is using while demanding reservations. The second part of the slogan insists that if reservation cannot be given to Patels, then the quota system should be abolished altogether - which has been on the not-so-hidden agenda of the BJP's parent organisation, the RSS. Such an aspersion appears to be true if one looks at the message that started being circulated on social media within an hour of the end of the Patels' rally. A message circulating on WhatsApp since the evening of 25 August exhorts the recipient to sign a petition asking the Prime Minister to "remove the caste-based reservation system". Thus, if the purpose of the Patel rally was to generate a nation-wide debate to abolish the reservation system altogether, it has been well served. Hardik Patel may not even be aware that he is being used as a puppet, but the Sangh Parivar's hidden agenda for ending all caste-based reservations has come to the fore. No wonder, along with masks of Sardar Patel and white caps with the legend "I am Patidar", some of the Patels also carried triangular saffron flags, possibly to indicate that their umbilical cord with the BJP's parent organisation has not been snapped. Even in style and modus operandi, the logistics of the Patels' rally had all the similarities with yet another one of the BJP's extravagant shows of strength. TWEET THIS The Patels' demand makes no economic sense. It flies in the face of Modi's claims of a developed Gujarat After the Patel rally, social media is full of calls for an end to reservation. Could it all be an RSS ploy?